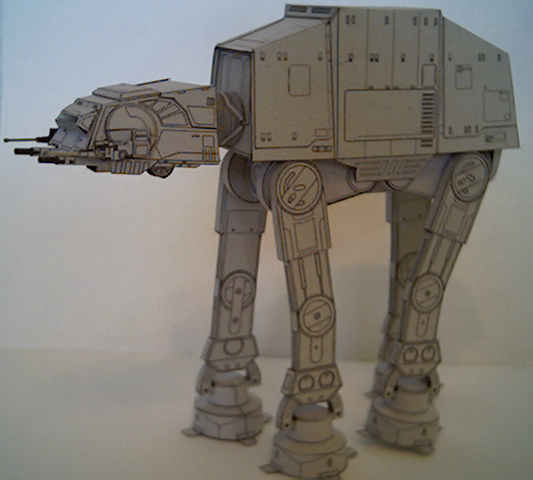 An Imperial AT-AT - Free Paper Model! 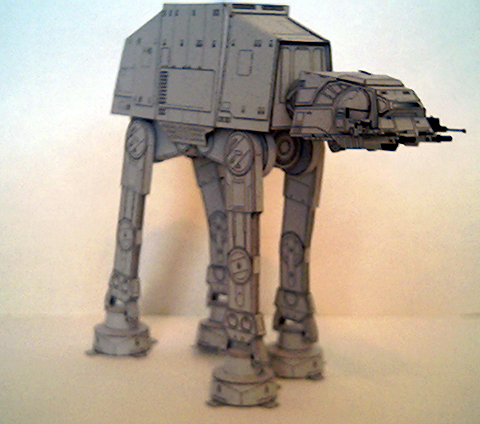 This is a card-stock All Terrain Armored Transport (AT-AT). The original designs were downloaded from SF Paper Craft. The model shown was built with the original unweathered designes. I later converted the pdf files into jpg files and did some extensive weathering in Photoshop using the magic wand and airbrush tools. There are five 8 X 11 part sheets, and it took about 30 - 45 minutes per sheet to get all the dirt and battle scarring done. Some of the small paper tubes were replaced with round toothpicks (much easier and a lot stronger). One of the cool things about these models is the final finish is done when they come off the printer, and if you mess up a part, just print a new one- great for younger modelers. A couple of construction techniques that I found helpful: Anywhere there is exposed white, i.e. the back side and cut edges of the printed patterns; I used a black Sharpie ink pen to color. This helps to "erase" the appearance of paper. Where there are intricate single sheet paper details that are otherwise flimsy, I added a coating of superglue. This turns regular card stock into a strong composite material. I also use high quality wood glue for all of the basic construction. Tite-Bond II dries twice as fast and is twice as strong as Elmer�s or other white glues. Here are the parts and instructions. Enjoy! Fred Smith is the President and Chief Editor of Sirius Replicas - Established 2001.